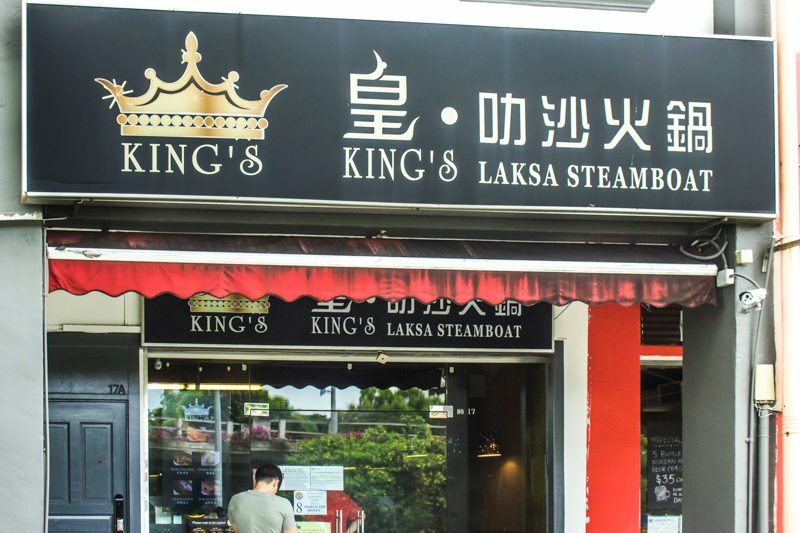 If you’re ever walking along Teck Chye Terrace and notice this massive sign, then you’ve probably come across King’s Laksa Steamboat before. Just a stroll away from Serangoon’s NEX, this steamboat restaurant is just one of many shophouses located along the stretch. 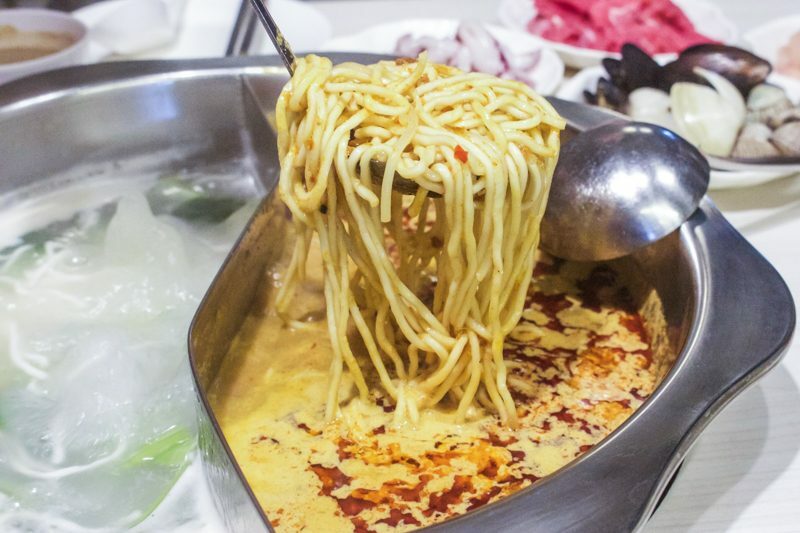 What they’re known for here is an all-you-can-eat steamboat buffet that comes with an affordable price tag— not to mention, various soup bases such as Laksa and Mala, that can be paired with over 80 different steamboat ingredients. The interior of the restaurant is simplistic, with a single colour scheme that runs throughout the restaurant and a few overhead lamps that have an orangey glow to them. 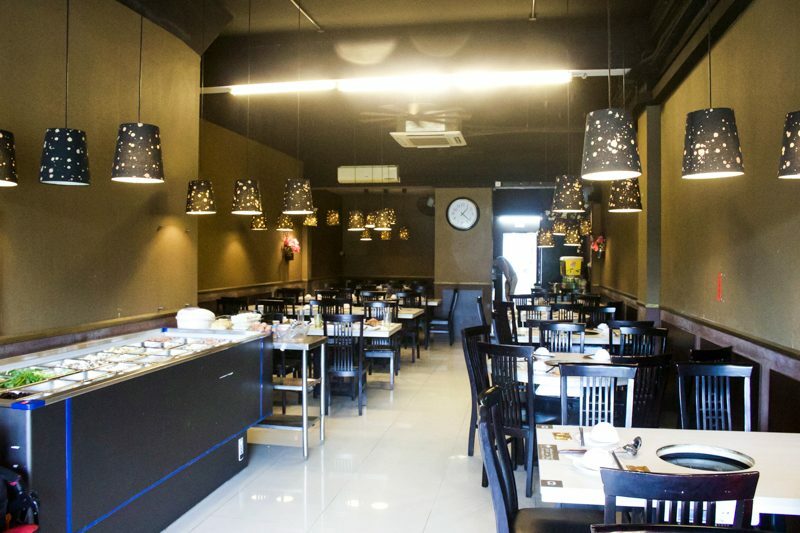 We visited during lunch hour and were surprised to find that it wasn’t quite as crowded as expected to be, so it’s safe to say that you can have your steamboat in peace. 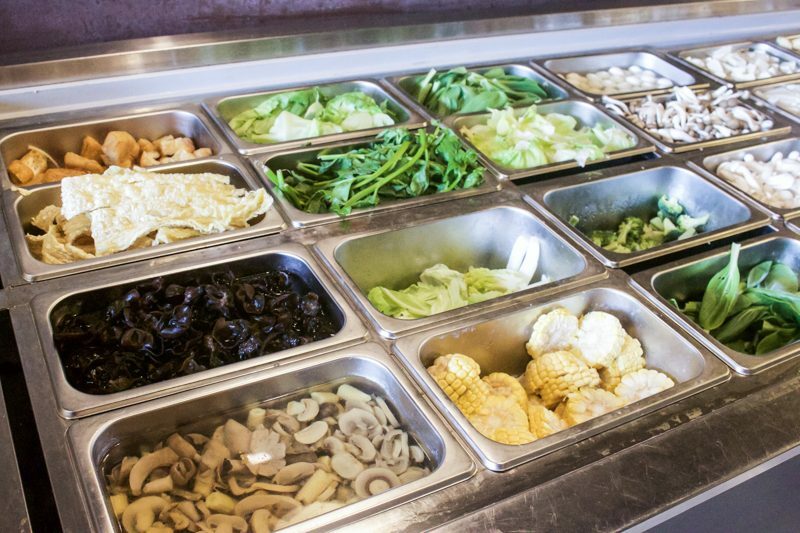 The first order of the buffet would be to decide what soup bases you want for your steamboat. Since we opted for the double sided pot, we went with the signature Laksa Broth and paired that with the Chicken Soup, as a more watered-down option. 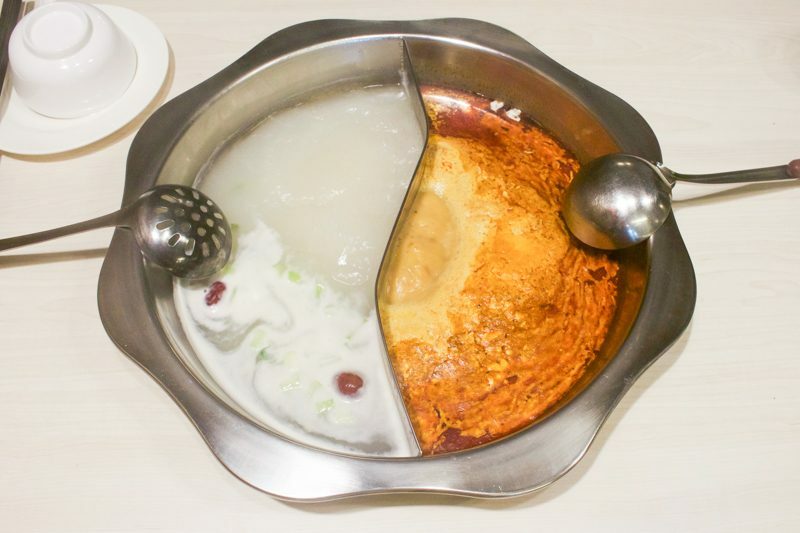 Other alternatives you can choose from include, the Sichuan Mala Broth, Herbal and Seafood soups. Whichever you choose as a second pairing, the Laksa is still a solid choice and was highly recommended by the staff. 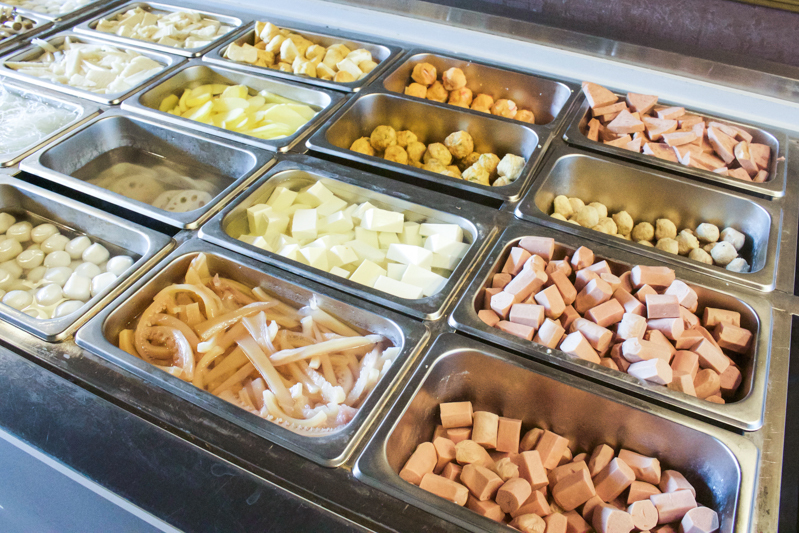 Upon selecting the soups, we proceeded to take a look at their selection of ingredients laid out on the counter. You’ll find that for the most part, the choices offered are pretty standard, with a range of vegetables such as, broccoli, corn, cabbage, alongside mushrooms and crunchy lotus roots. 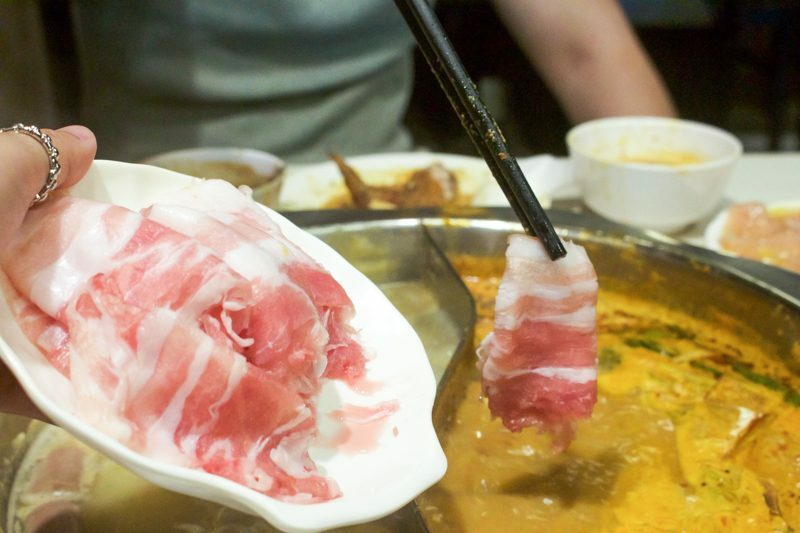 As for the processed ingredients, they had the typical steamboat fare including cuttlefish, fish balls, meat balls, luncheon meat and sausages. On the side, they also had a few types of noodles to choose from so, be sure to stock up on some carbs! While the more premium ingredients were not on display, you can feel free to order them directly off the menu. There are various cuts of meat to choose from — expect to find everything from beef and chicken, to lamb and pork. 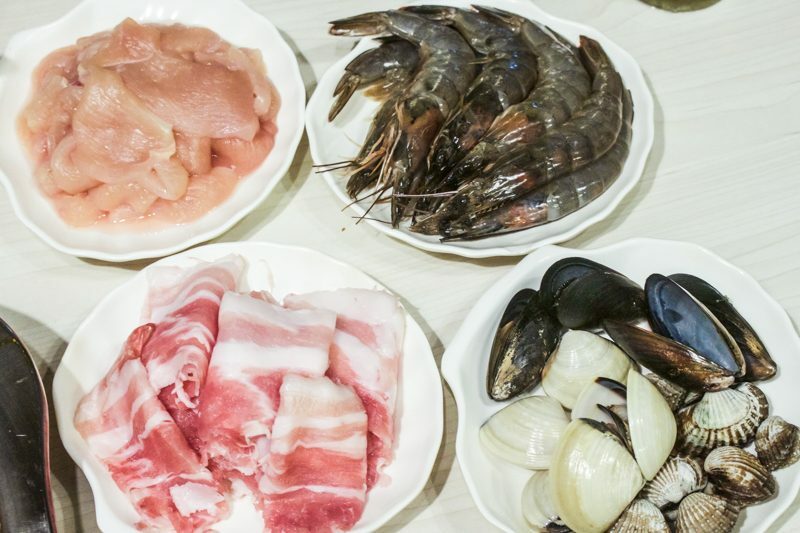 And, let’s not forget the seafood ingredients that consists of cockles, clams, mussels, fresh prawns and even flower crab. We personally enjoyed the sliced pork belly and found that they were simply delectable when cooked in the creamy laksa broth. Each slice of pork was notably tender and had just the right fat to meat ratio, which we thoroughly appreciated. If you’re not a fan of the cuts with higher fat content, then opt for leaner cuts of meat like the sliced beef. Obviously, we couldn’t go without pairing the laksa noodles with the broth. For a restaurant that prides themselves in its authentic laksa broth, they certainly did not disappoint in this department. Not only was the soup base rich in coconut milk, but it was also adequately spicy and not overwhelmingly so. We found that we were able to slurp up as much of the soup as we wanted without feeling too turned off by the spice. Furthermore, the chicken soup did help to cleanse our palates as it was lighter tasting. You’d be pleased to know that the buffet doesn’t just provide raw ingredients, they serve fried side dishes, as well. 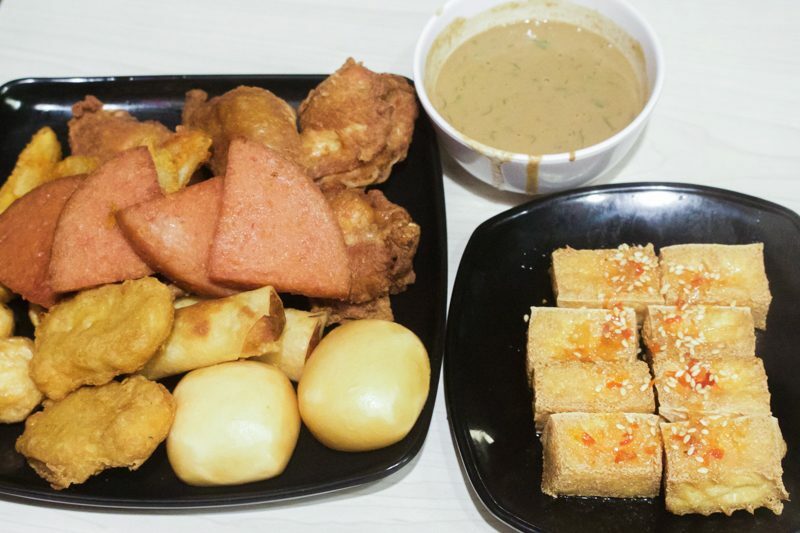 In fact, they have a widespread array of appetisers ranging from fried spring rolls, fluffy mantou buns and nuggets to luncheon meat slices and delicious prawn paste chicken wings. These really served to keep our tummies filled while we were waiting for the steamboat ingredients to boil over. What’s more, each of these dishes are fried a la minute so, you know that they’re guaranteed to be fresh! 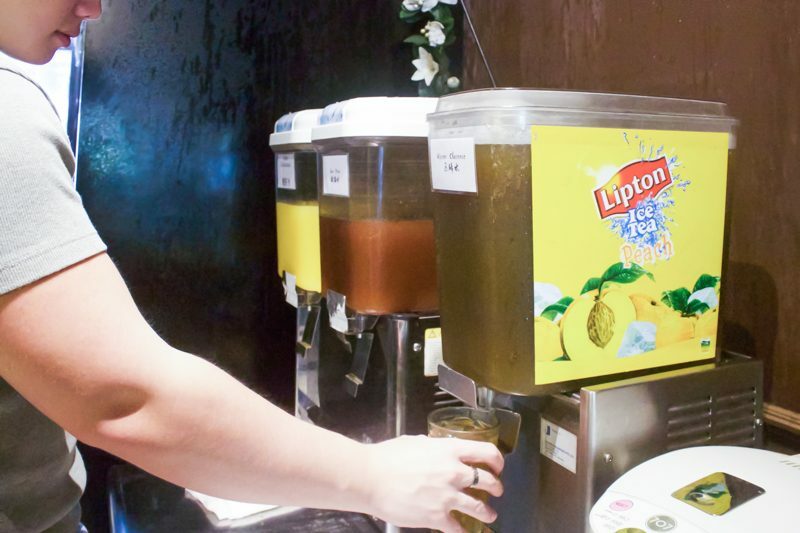 Last but not least, you can help yourself to the free-flow drinks. They have a small selection of sour plum juice, lime juice and water chestnut. But hey, that’s more than enough for us because we were too focused on the food. Oh, and did I mention they have an ice cream counter too? Perfect to end off the meal on a sweet note. 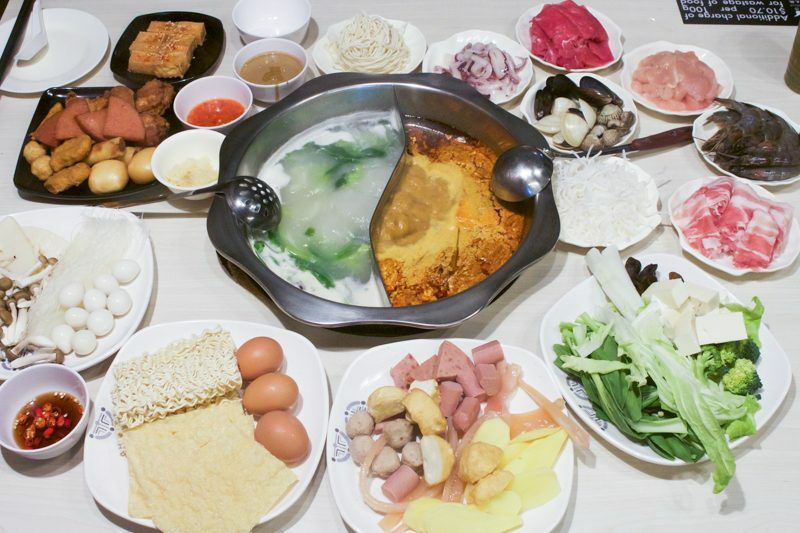 For a warm and comforting steamboat experience with friends or family, you should definitely try King’s Laksa Steamboat. Prices start at $20.80++ for Adults & $16.80++ for Children on weekdays, and $25.80++ for Adults & $16.80++ for Children on weekends. Taking into consideration the fact that you can eat to your heart’s content, you’ll certainly get your money’s worth when dining here.